The Mazda Tribute (Code J14) is a compact SUV made by Japanese automaker Mazda from 2000 to 2011. It was jointly developed with Ford Motor Company and based on the front-wheel drive Mazda 626 platform, which was in turn the basis for the similar Ford Escape on the CD2 platform. The Tribute was priced below the Ford Escape and Mercury Mariner in Ford's CD2 SUV lineup. The Tribute and Escape debuted in 2000, offering front or all wheel drive and a choice of a transversely mounted 2.0 L Ford Zetec 4-cylinder engine or 3.0 L Ford Duratec V6. Ford Escape was also sold as the Ford Maverick in Europe with a Ford 2.0 L I4 Zetec engine with manual transmission, or 3.0 L Duratec coupled to automatic transmission. One main difference between the Tribute and the Ford Escape/Maverick is that the Tribute's suspension is tuned for a firmer ride than the Escape/Maverick, in order to correspond with Mazda's sporty image. As Mazda had offered "spiced up" models in other segments such as the Mazda 3 and CX-7, the utilitarian Tribute was replaced by the more aggressively styled Mazda CX-5 in North America. The Tribute made its debut at the 2000 Los Angeles Auto Show as a compact crossover SUV, a segment pioneered by the Toyota RAV4 in 1994. Its conservative styling resembled the Mazda Navajo, a rebadged two-door Ford Explorer which was retired in 1994. In Japan, Mazda had an SUV called the Mazda Proceed Levante, a rebadged Suzuki Escudo, but the Tribute was Mazda's first original SUV. The Ford plant in Claycomo, Missouri assembled the Tribute for the North American market, alongside the Ford Escape. The Mazda plant in Hofu, Japan and the Ford Lio Ho plant in Taiwan also assembled the Tribute for their respective markets. The 2.0 L 4-cylinder engine had timing belt-driven Camshafts, while the 3.0 L Duratec V6 featured a maintenance-free timing chain. 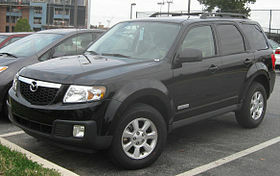 Both the Escape and Tribute were refreshed in 2004 for the 2005 model year. The base engine became the Mazda 2.3 L MZR 4, while the optional V6 remained the 3.0 L Duratec. In North American-built models, a floor-mounted automatic transmission shifter replaced the column shifter; However, Japanese-built models continued with a column shifter. Mazda Japan released a limited version, the Mazdaspeed Tribute, in 2004. The model featured a 2.3 L MZR engine providing 200 PS (147.05 kW) and 254 N·m or torque (195 lb·ft). Production ended in 2005. A significantly face-lifted version of the Tribute was released in the second half of 2006 for Asia Pacific markets. The updated Tribute featured a larger, bolder grille, with an enlarged Mazda emblem, as well as restyled front bumper and headlights. Side mirrors featured integrated indicators. On the inside, changes included a new floor mounted automatic transmission shifter, in place of the old column shifter (Asia-Pacific model only; US-built Tribute gained the floor shifter in 2005). The dashboard was updated with a new radio, and automatic electronic climate control on certain models. Mechanically, the rear drum brakes were replaced by disc brakes. Engines remain the same, but the V6 has been modified to reduce fuel consumption by over 10%, while the 4-cylinder has improved mid-range torque and an electronic throttle. Both engines had been certified to meet Euro III emission regulations. In 2007, Mazda stopped selling and producing the Tribute in Japan, and replaced it with similar sized CX-7. In 2008, Mazda Australia also discontinued the Tribute, its absence filled by the CX-7 introduced in the previous year. For other Asia-Pacific markets, production was shifted to the Ford Lio Ho plant in Jhongli, Taiwan, which also produces Tribute's Ford Escape twin for Asia-Pacific markets. This arrangement continued until early 2010, when the Tribute for the Asia-Pacific markets ceased production, being fully replaced by the CX-7 imported from Japan. 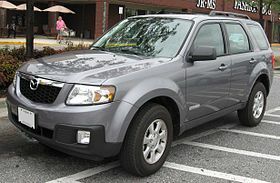 In 2007 for the 2008 model year, the Tribute was significantly revamped, like its Ford Escape and Mercury Mariner siblings. Originally set to be renamed the Mazda CX-5, the vehicle kept the Tribute name. The changes were significant, but fell short of a "clean sheet" redesign, as the vehicles remained on the CD2 platform, and kept the existing 2.3 L MZR I4 and 3.0 L AJ V6 engines. Visible changes included all new sheet metal and interior. The interior was significantly upgraded using all new components and higher quality materials, and was generally praised by automotive journalists. However, unlike the first generation of the Tribute, which had unique exterior and interior from its siblings, the new model only differs from its siblings in the "nose" (front fenders, hood, and front fascia), tail lights and detailing. Notable changes to the exterior include a higher belt line and more pronounced wheel arches. Overall the car was designed to look larger and more substantial than the previous model. As a cost-saving measure, rear drum brakes, replaced the previous discs, to criticism from the automotive press. The 2008 Tribute (non-hybrid) was first unveiled at the 2007 Montreal International Auto Show and went on sale in March 2007. A new addition was the Hybrid model which was previously only available on the Ford Escape and Mercury Mariner. The Tribute received additional major changes to improve performance for the 2009 model year, mostly by way of mechanical upgrades. Most significant were all new engines; Mazda's new 2.5 L MZR I4 replaced the 2.3, boosting horsepower to 171 bhp (128 kW; 173 PS) and 171 lb⋅ft (232 N⋅m) of torque at 4000 rpm. Despite increased horsepower, fuel economy also increased by 1 mpg‑US (240 L/100 km; 1.2 mpg‑imp) on both urban and extra-urban cycles. The optional 3.0 L (AJ) V6 was updated, resulting in a 40 hp (30 kW) increase, bringing output to 240 hp (180 kW) and 233 lb⋅ft (316 N⋅m) of torque. It also brought a 1 mpg improvement in fuel economy. The Tribute Hybrid was dropped after the 2009 model year. Another significant change was the switch to Ford's new 6F 6-speed automatic, which became standard on all V6 equipped models and optional on the I4. As well, new front and 18.5 mm (0.73 in) rear stabilizer bars were added for 2009 to improve ride handling after complaints about diminished performance following the 2008 changes. Others changes included redesigned seats, daytime running lamps, optional steering-mounted audio controls, and other additional features. The Tribute was discontinued at the end of the 2011 model year, replaced by the Mazda CX-5 in 2012. ^ Sarne, Vernon (2012-06-27). "Ford makes 'business decision' to stop manufacturing cars in PH". Top Gear Philippines. Retrieved 2013-06-03. ^ "Mazda Tribute 2001-2006 review". Samarins.com. Retrieved December 12, 2008. ^ "Sneak Peek: 2008 Ford Escape". Detroit News. Retrieved April 19, 2006. ^ "2008 Mazda Tribute s Touring – First Drive Review". Car and Driver. Retrieved 11 January 2009. ^ "2009 Mazda Tribute Review". Retrieved 11 January 2009. ^ "New CX-9 is Mazda's latest crossover". Montreal Gazette. Archived from the original on March 24, 2007. Retrieved January 21, 2007. ^ "2009 Tribute". MazdaUSAMedia. Retrieved 2009-08-19.